Hot, hot, hot! When the weather is hot, you don’t want to be slaving over a hot stove. 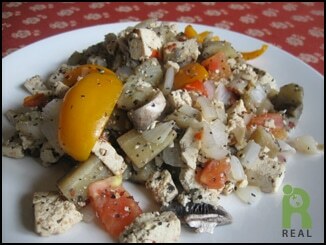 Stir fry dishes are quick and make good use of the wonderful vegetables that are in season. I love the colorful, sweet bell peppers. They can be expensive, because it takes a while for them to ripen. (Green bell peppers are simply red, yellow or orange peppers that have not fully ripened). During the summer when they are in season and the price comes down a bit, I put them in everything. In a large fry pan, heat the wine on medium heat. Add the tofu cubes, sprinkle the basil over them and stir to evenly coat. Cook until almost all the liquid has disappeared. Add in the eggplant and onions. Continue to cook, stirring occasionally. When the eggplant and onions are limp and almost translucent, stir in remaining ingredients: pepper, tomato and mushrooms. Let cook another 5 minutes. Season to taste. I like adding about a teaspoon of hot sauce or red pepper flakes to heat it up a bit. ← Cape Cod, Lobsters, Hot Dogs, The Vegan Imperative!